06 Apr Are Waterfall Countertops Just a Fad? While they originated in ultra modern designs, waterfall countertops are rising in popularity in several design styles these days. They give off a sleek, clean, and contemporary appearance. However, are waterfall countertops just the latest trend? Or do we think they will stick around for a few years to come? Waterfall countertops can work beautifully on both kitchen islands and on a peninsula. Some homeowners may choose to include waterfall countertops to protect wood countertops and help to hide appliances. They work extremely well in high traffic areas since they are typically easy to clean and are more durable than cabinets; thus, they can withstand constant bumps and dings. We recommend including waterfall countertops in larger kitchens, or kitchens with an open concept. The extra slab of countertop material may be overwhelming to small, enclosed spaces. Additionally, a dark colored waterfall countertop can make the room feel heavy, which is why many homeowners choose a lighter color-such as a bright white or a warm beige. 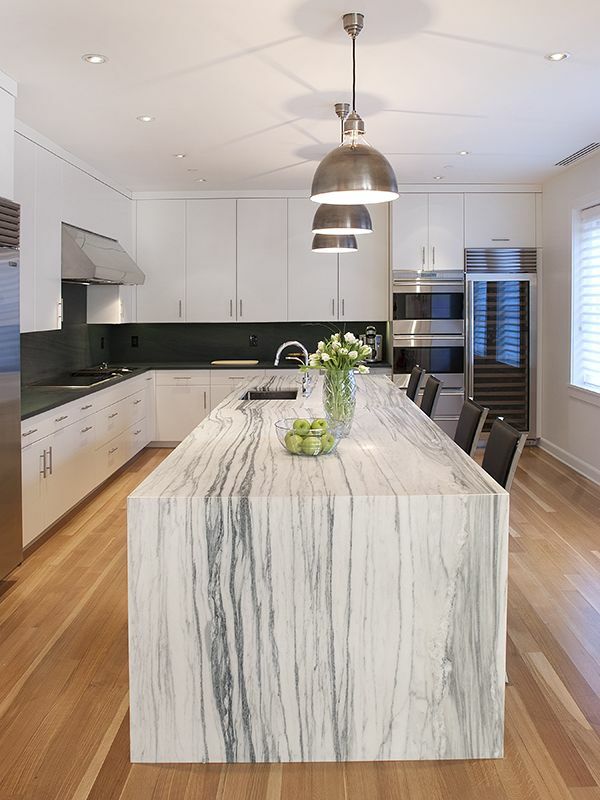 When choosing a material for a waterfall countertop, durability is a huge concern. Try to pick a durable material, such as granite or quartz. Choosing between a solid color slab versus one with more speckles and veining is up to you. Keep in mind that waterfall countertops tend to serve as a focal point in the room, so choose a texture that you love and won’t be too overwhelming to your space. Another factor you should consider about waterfall countertops on kitchen islands is the enclosed seating underneath. Since the “waterfall” section is the same width as the countertop, there will be extra material at the end of the seating area of your island. For those who love to entertain and are looking to include as much seating as possible, a waterfall countertop may not be the best option. Foregoing a waterfall countertop will allow you to squeeze in one or two more seats when there are a lot of guests over. If you plan on selling your home in the near future, you may not want to include this trend. 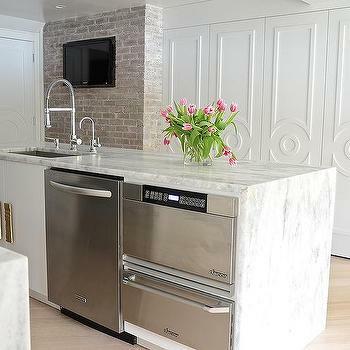 While some love the look of waterfall countertops, others may not be a huge fan. When remodeling a kitchen for resell, it is best to choose timeless finishes and materials to avoid turning away any potential buyers. Having a waterfall countertop will help to create a clean, updated look to any kitchen remodel or renovation. While they may be one of the last trends right now, who knows-they may turn out to be a timeless staple in kitchen design. If you love waterfall countertops, add it to your kitchen! Your kitchen should be a place that you love spending time in. When planning a kitchen remodel, try not to get too caught up in what’s in and what’s out and choose pieces that you love.